Marks often appear in several situations such as affected skins due to pigment changes, pregnancy, intake of some medications, damaged skins after a dermatological procedure. 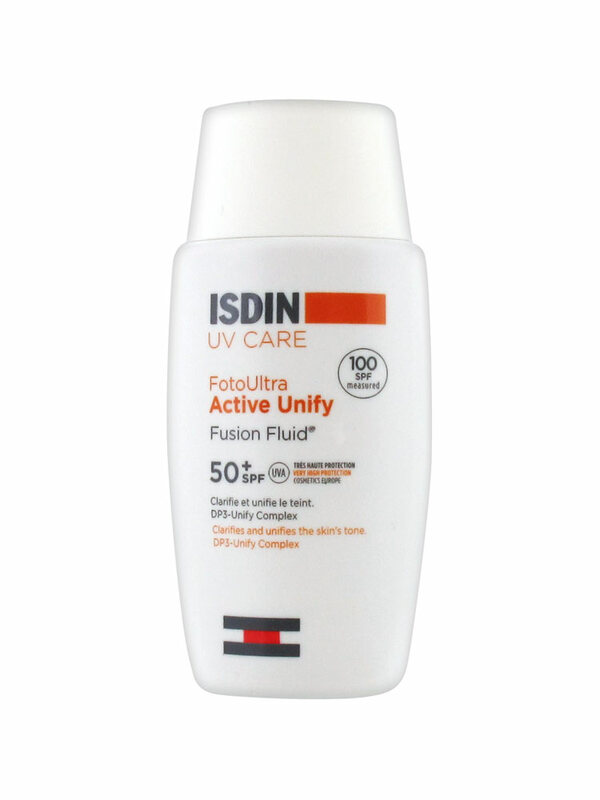 Isdin UV Care FotoUltra Active Unify Fusion Fluid SPF 50+ 50ml is a sun fluid with depigmenting action with SPF 119 and UVA in-vitro 49, that clarifies and evens the complexion. 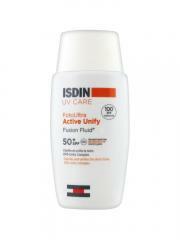 This fluid helps reduce pigment marks provoked by sun exposure thanks to the DP3-Unify Complex with proven efficiency. This complex regulates the production of melanin and reduces the pigmentation. It evens the complexion and protects against visible light. This fluid protects from UVA rays responsible of pigments troubles, it is two times more efficient than classical SPF50+ protections. The texture of this fluid melts on the skin, the application is pleasant. Resistant to water, tested on dermatological control, hypoallergenic, biodegradable formula. Apply 1-2 times per day, morning and noon, on a cleansed and dry skin. If you have pigment marks provoked by the sun, avoid the direct sun exposure. Can provoke a light irritation of the eyes. Indication: Sun fluid with depigmenting action. Aqua (Water), Dibutyl Adipate, Cyclopentasiloxane, Octocrylene, Niacinamide, Alcohol Denat, Titanium Dioxide, Butyl Methoxydibenzoylmethane, Cyclohexasiloxane, Bis-Ethylhexyloxyphenol Methoxyphenyl Triazine, Butylene Glycol, Peg-30 Dipolyhydroxystearate, Glycerin, Nylon-12, Peg-10 Dimethicone, Sodium Chloride, Phenoxyethanol, Silica, Dimethicone, Phenetyl Resorcinol, Disteardimonium Hectorite, Panthenol, Tocopheryl Acetate, Allantoin, Glyceryl Stearate, Parfum (Fragrance), Disodium Edta, Ethylhexylgycerin, Sodium Hyaluronate, Dimethiconol, Peg-8, Tocopherol, Tetrapeptide-30, Ascorbyl Palmitate, Ascorbic Acid, Citric Acid. Quality great. Recommend to anyone who cares for their skin.